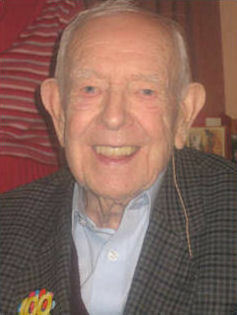 Alec Fozard, master butcher, former European black pudding champion, and last year’s pie club guest judge (when he was a mere 99 years old) celebrated his 100th birthday on 30th December 2007. 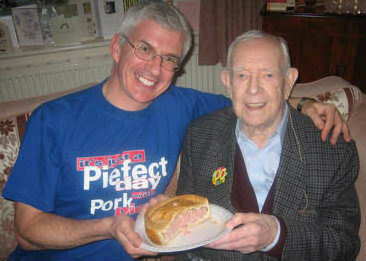 His family, all pork pie enthusiasts, challenged Alec to a pork pie making contest, which was held on his birthday. 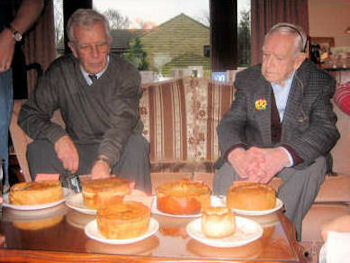 One of the pie club’s longest serving members, Richard, was honoured to be invited to judge the contest. In true competition style, the entries were numbered to ensure no bias took place. Six pies were entered by different members of Alec’s family. To a crowded birthday gathering, Richard announced his comments and then announced the results in reverse order. The names of the pie entrants were then revealed to the judge. 1st Alec Fozard, master butcher and still a champion at 100 years old. 2nd (close) Jim Batty, Alec’s son-in-law and amateur pie maker. 3rd (equal) Karen Batty, amateur pie maker. 3rd (equal) Jane Smith (nee Batty) (bought pie in Kirkheaton). 5th (equal) Nick Batty (bought pie in Mirfield). 5th (equal) Ben Batty (bought pie in Dewsbury).